I have started working on knitting hats for several of the grand-nieces/nephews and maybe some of the nieces/nephews too. These two are for grand-nieces. The one with the pink crocheted rose is the Aviatrix hat. The pattern is Aviatrix hat by Justine Turner. The white yarn is Cascade Yarns 220 Superwash. The pink yarn is left over Malabrigo Yarn Lace from the swirl jacket I knit a few years back. 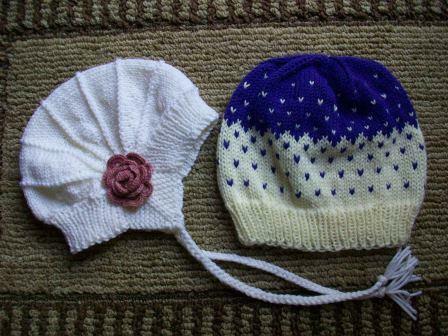 The pattern for the blue/white hat is Kitimat by Kayla Sparkes. Both yarns are HiKoo by skacel Simplicity.